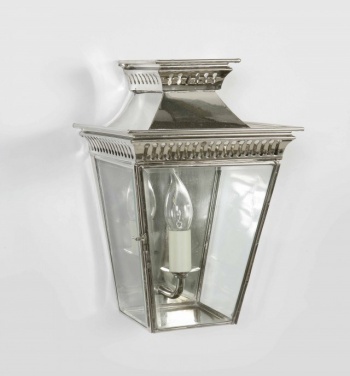 Pagoda Passage Lamp shown in polished nickel finish. This elegant flush light is part of the Pagoda family, a traditionally styled range of lanterns and pendants which will take you back in time. It has a graceful presence with delicate fretwork detailing to the two tier canopy,and is ideal for patio and garden walls.